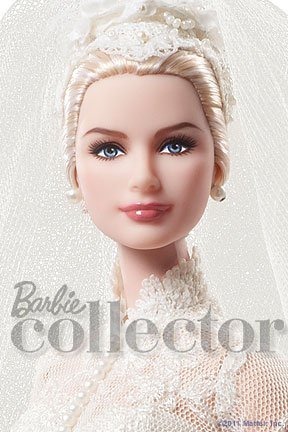 Grace Kelly Silkstone Bride Barbie photos revealed. 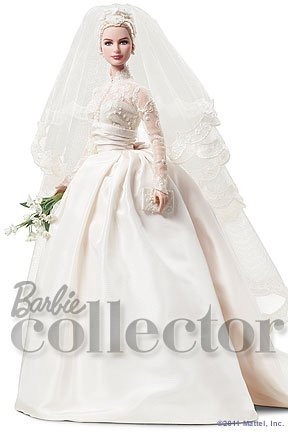 Mattel has shared the first photos of the new Grace Kelly Silkstone bride Barbie. She has a new face mold. Not the same vintage inspired face mold of the BFMC but an entirely new one. In my opinion, she is stunning. I hope that the actual production doll is just like the promo photos. Her price will be steep. Right now it appears she will retail for around $180.00 and should be out this summer. She was designed by Robert Best and if the photos are anything to go by, the detail is amazing. Can’t wait! Must start saving now. All photos are property of Mattel, Inc. This entry was posted on April 13, 2011 by raberry65. It was filed under Barbie, Silkstone and was tagged with BFMC Barbie, Grace Kelly Bride Silkstone Barbie. Isn’t she gorgeous! Can’t wait to see the real life photos of this lady.